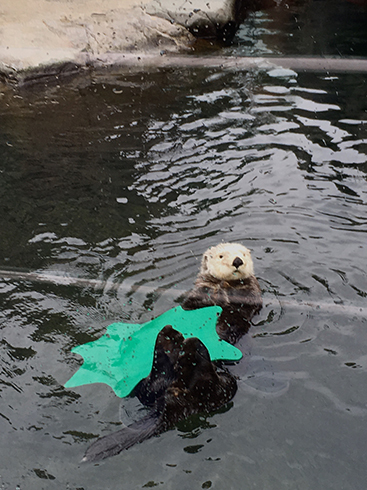 When we went to Vancouver a couple of months ago one of the most memorable things was seeing the adorable sea otters. 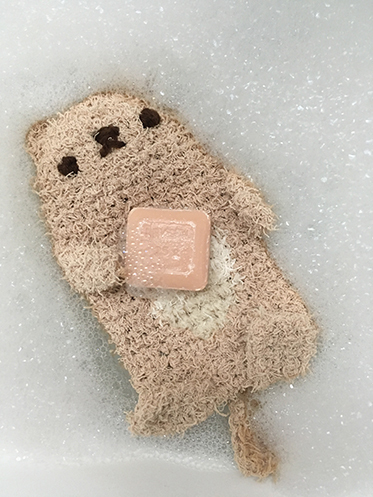 Actually, our test shows that the otter sinks after the holding the soap for a while… but still, it’s fun to see it floating on its back. 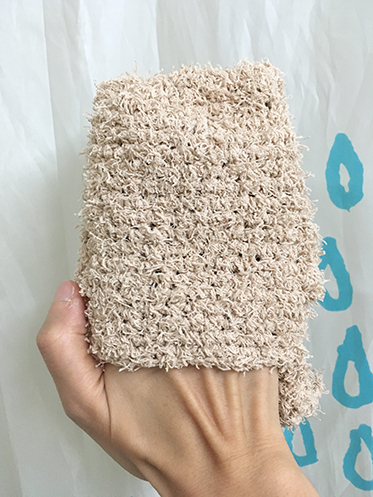 This cotton yarn is super absorbent and softer than regular polyester scrubby yarn, so it makes a great wash cloth. 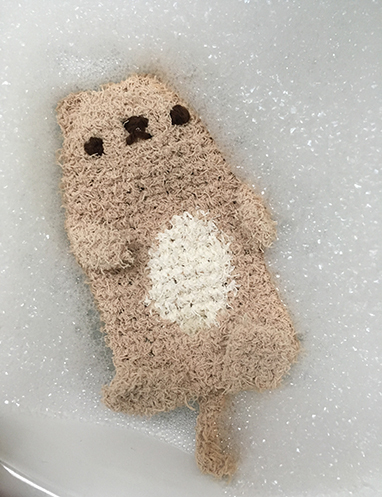 One skein of scrubby makes 2 otters with plenty leftover for a knit wash cloth, which is quite economical for holiday gift‐making. 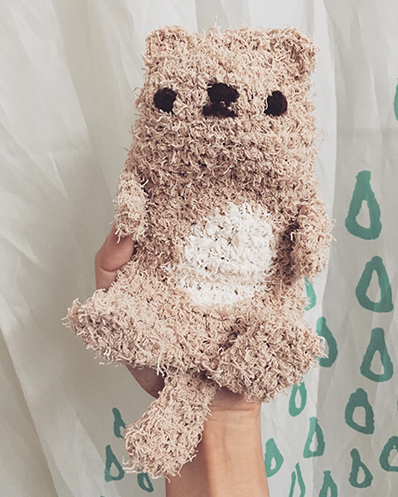 The otter is worked from top down in the round in the top part, then worked back and forth in the lower part and seamed at the sides in order to create an opening in the back. Then arms and legs are crocheted separately and sewn on. 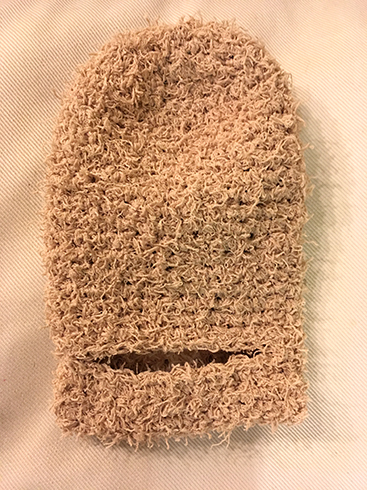 Ears are crocheted directly onto the head. 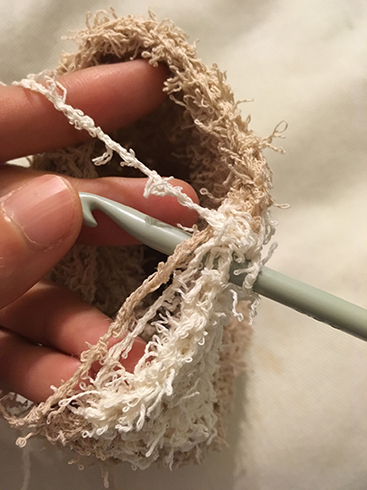 The texture of the yarn makes it a bit challenging to see the stitches, and it is sometimes a bit difficult to undo stitches, but it’s great for blending in yarn ends and sewn seams. This pattern is written with this in mind and the structure is made as simple as possible. Round 1: with tan, 10 sc in magic ring, don’t join in the round. Round 2: 2 sc in each sc (20 sc). Round 3: [1 sc in next sc, 2 sc in next sc] around (30 sc). Repeat round 4 until piece is 3.5″ tall. 6 sc, attach loofa (white), 3 sc in white, switch back to tan. Switch back to tan and 1 sc in each sc using tan, until the stitch before the first white stitch in the row below, switch to white, sc in next 7 sc using white, switch back to tan. 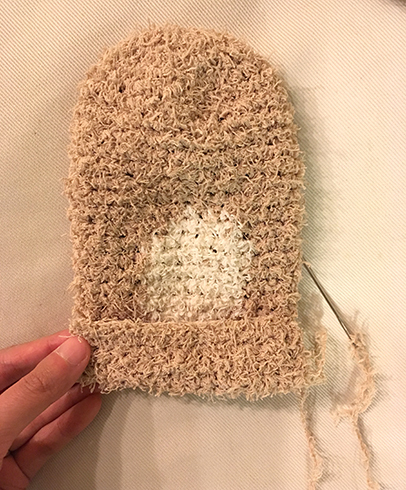 Continue crocheting in the round, using tan in tan stitches and white in white stitches until there are 4 more rows with white stitches. Then, sc in each sc around using tan until the first white stitch in the row below, sc with tan in first white stitch, switch to white, sc with white in next 5 sc, switch back to tan. sc in each sc around around using tan until first white stitch in the row below, sc with tan in the first white stitch, switch to white, sc with white in the next 3 sc, switch back to tan, fasten off white. sc in next 6 sc using tan, turn, leave remaining stitches unworked. 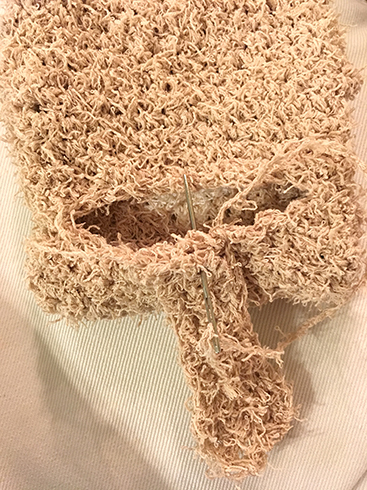 Lower body is worked back and forth in rows over 15 stitches. Row 1: ch 1 (does not count as sc), sc in next 15 sc, turn. 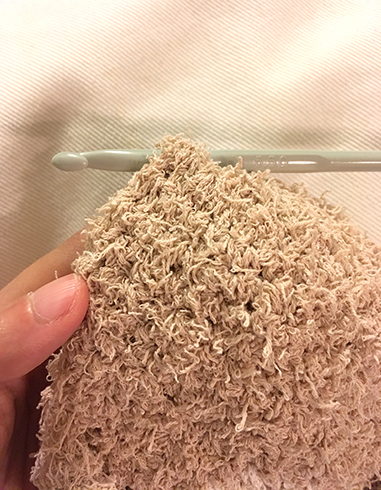 Rows 2–8: repeat row 1, leave a long tail for sewing, fasten off. With right side facing, fold lower body piece up in half, sew side seams together. Turn lower body piece right side out. At the back opening, sew together the top and bottom stitches closest to the seam on each side, like the picture below. 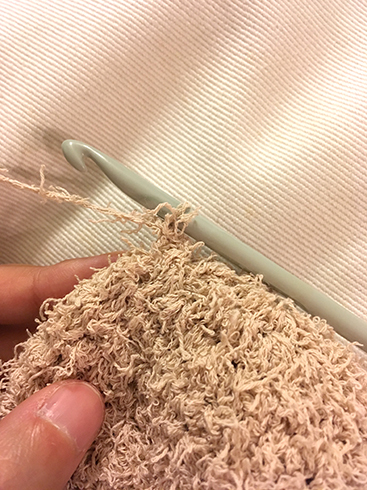 To sew the other stitches closest to the other seam, I didn’t fasten off, I just wove the working yarn through the top edge of the bottom part of the opening, and actually cinched / gathered the stitches a bit to make the opening more sturdy. Row 1: Using tan, ch 6, sc in 2nd ch from hook, sc in next 4 ch, turn. Row 2: ch 1 (does not count as sc), sc in next 5 sc, turn. 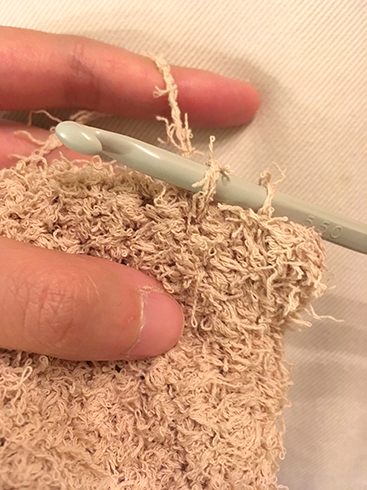 Rows 3–5: repeat row 2, leaving a long tail for sewing, fasten off. Fold arm in half so the first row meets the last row, using the yarn tail, sew along side and top of arm using whip stitch, then sew arm to body along the side, also using whip stitch. 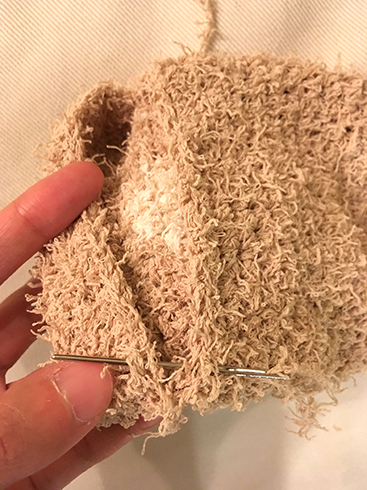 Rows 3–7: repeat row 2, leaving a long tail for sewing, fasten off. Fold leg in half so the first row meets the last row, using the yarn tail, sew along side and top of arm using whip stitch, then sew arm to body along the bottom of body, also using whip stitch. Row 1: ch 12, hdc in 3rd ch from hook, hdc in next 2 ch, sc to end of row, turn. Row 2: ch 1 (does not count as sc), sc in each sc, hdc in each hdc, turn. Row 3: ch 2 (counts as hdc), hdc in next 2 hdc, sc in each sc, leaving a tail for sewing, fasten off. Sew tail to edge of bottom park of opening on back using whip stitch, like so. Insert hook through a stitch on the side of the head. 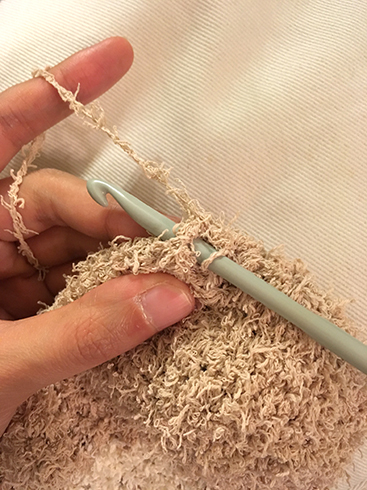 Pull up a loop of yarn and secure yarn. Insert hook in a stitch to the left. Pull up a loop, then yo and pull through both loops on hook, thus making an sc. Make 4 more sc in the same stitch, then sl st in a stitch to the left in head. Repeat for the other ear on the other side of head. Embroider eyes, nose and mouth with acrylic yarn. Fasten off and weave in ends. As usual, let me know if you have any questions about the pattern! 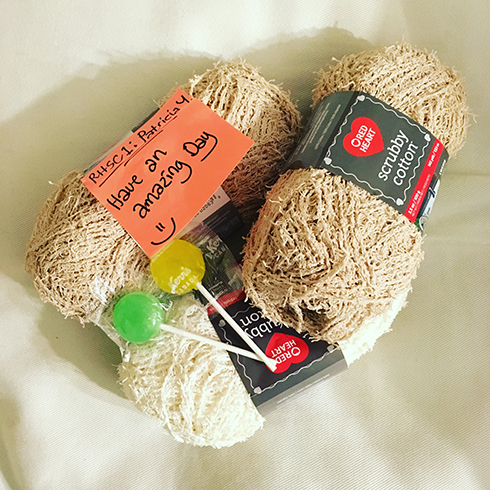 Special thanks to the nice people at Yarn Canada for thinking of me and sending the yarn :) Please do check out their website if you live in Canada, free shipping for orders over $45, or flat rate of $5! I just love this little fella! Thank you! I’m glad you like him! Thank you for visiting! Ravissant! attendrissant! superbe! Bravo!! Claudine. This is just the cutest! Can’t wait to make him right away. 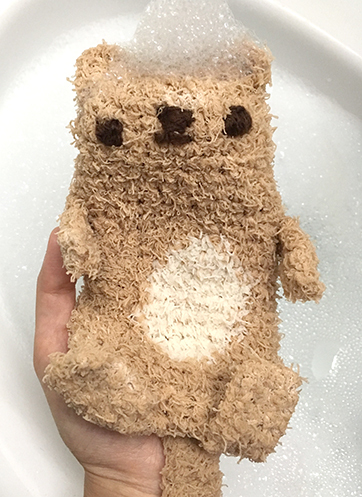 He is different than any other bath mitt I’ve seen, and that yarn gives him extra dimension. Thank you for sharing this pattern! thank you Jennifer! happy crocheting!